The Davenport Brothers at the Melbourne Town Hall, 1876. The Davenport brothers were famous spiritualists who took their show to the road in the late 19th century. For many years, they performed with little variation the act they brought to Australia. Houdini later said that the Davenports used escapology in their act and this was assumed by Australian newspapers. The brothers performed continuously until William's death in Sydney in 1877. The first public performance of the Davenport Brothers in Australia took place on Saturday 2nd September 1876 at the Melbourne Town Hall. The Town Hall located on the corner of Collins and Swanston Streets had been completed in 1870. It was thus, a relatively modern building at the time. In addition to it’s offices for administration, the building had a large auditorium . This auditorium was suitable for theatrical exhibitions, although perhaps too large for the Davenport show. The doors of the building were opened at 7.15pm sharp that Saturday night and the hall filled quickly and noisily. A constant stream of carriages from which people from all walks of life descended surrounded the sandstone building. The indolent rich and working people had all been attracted by the large advertisements in the Age and the Argus. Most of the latter crowded the two shilling seats at the back of the hall. Placed on centre stage was the celebrated cabinet. The front of it had three doors, the centre one with a diamond shaped aperture covered by a black curtain. Inside the cabinet were two fixed seats about 8 inches wide. Holes had been drilled into these seats so that the brothers could be tied to them. A narrow shelf ran along the back of the cabinet. On this shelf was placed a variety of instruments. The whole was designed to be easily taken apart so it could be transported around the world. .
At 8pm, Professor William Marion Fay, ‘ a stout and square built man’ opened the proceedings. Fay acted as the master of ceremonies throughout the performance. Shortly after Fay made his brief bows, the brothers Davenport appeared on stage. Ira, the elder, and William the younger. They were both small men, but described as being ‘ well made’. William appeared to be the more robust of the two to outside observers. The audience , via acclamation, selected Mr Harwood, from the Theatre Royal and Mr Gatehouse, a former mayor of Melbourne, to represent them. A Mr Cable from Sydney also volunteered his services. Mr Fay asked if the audience had any objection to these three gentlemen. There being no protest, the three ‘ referees’ climbed onto the stage. However, it was only minutes before a man in the front seats protested against the inclusion of Mr Cable. The protester assumed that Mr Cable was an accomplice of the performers and demanded that he be replaced. Mr Fay had no objection and Mr SV White replaced Mr Cable. Mr Cable was rather insulted by the implication that he was not an honest man, and stepped down rather reluctantly. Having appointed a satisfactory committee , it was time to commence the main part of the show. The cabinet doors were opened and William and Ira Davenport entered it, and sat down. Mr Gatehouse and Mr Harwood tied the brothers, hand and foot to the wooden seats. The two referees stepped away from the cabinet their backs towards it. No sooner had the two side doors of the cabinet been closed that some white fingers, appeared on the edge of the doors. This hand then buffeted Mr Gatehouse on the head. A hat which Mr Davenport had been wearing was transferred to Mr Gatehouse’s head as the centre door closed. The doors of the cabinet were once again shut. Noises from musical instruments reverberated through the hall. Bells were rung by mysterious hands. Hands and arms 'plebeian shaped and not overly clean’ appeared at the aperture . When the doors were once again opened the two brothers sat mute and still and tied as before. The two referees were embarrassed and a German gentleman with spectacles caused much amusement when he repeatedly climbed on stage to get a closer look at the performance. Each time he muttered in disappointment that he could see nothing. Mr Gatehouse was then tied to one of the brothers and locked inside the cabinet with them. The manifestations appeared as before. Mr Gatehouse was confused and upset and professed himself unable to explain the phenomena. He also caused some merriment. After being released from the cabinet, he carefully felt his pockets and taking out his watch, ensured that his valuables were safe. When it was Mr Harwood’s turn to enter the cabinet, Mr Gatehouse asked that he not be tied. Professor Fay however, forbade this. Once again the music played, the hands appeared and the brothers were finally revealed to be tied as before. After these demonstrations, flour was placed in the brother’s hands. The cabinet was closed again. The mysterious manifestations appeared. Suddenly the doors opened and the brothers walked out , free, the flour undisturbed in their hands. It was noted by many that one of the brothers, probably William, appeared hot and flushed with perspiration on his face after he was revealed. Many of the audience and reviewers took this as a sign that he was doing all the tricks. However, it was more likely that William was already suffering from the illness that would kill him less than a year later. After the cabinet manifestations, it was time for the dark seance. 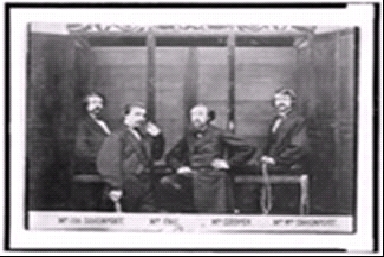 Professor Fay was tied to a chair whilst two of the volunteers held the Davenport Brothers. The lights were lowered and the auditorium plunged into darkness. Some members of the audience lit matches, hoping to catch Professor Fay in some trickery. After complete darkness had descended the professors coat was whisked off his back and went flying through the air. When the gas was lit and light bathed the scene again, he was found to be securely and firmly tied to the chair. Professor Fay then told the audience that the final part of the performance did not always work. He asked them to respect the conditions the performers had laid down. The lights were lowered again and guitars, made luminous by the addition of phosphorescent oil went flying through the air. Music was played, bells were rung, tambourines were struck and a general cacophony of sounds filled the air. When the lights were raised again, Fay and the Davenports were revealed to be firmly secure. At 10pm the performance concluded. Many in the audience reacted by hissing. Many also applauded, having been entertained and puzzled by what they had witnessed. Professor Fay had earlier been asked if he and the brothers professed that the spirits were responsible for the phenomena on display. Fay had replied carefully. The Age critic however, was not interested in spirits or trickery. He was more concerned with the behaviour of the audience. He was most chagrined that they had left before the traditional playing of the national anthem. William Davenport died in Sydney at the Oxford Hotel on 1st July 1877. Ira went back to the United States after burying his younger brother at Rookwood cemetery. William Marion Fay settled in Australia. His family eventually settled at Kew in Victoria. His descendants fought for Australia in the First and Second World Wars. In 1915 Fay became an Australian citizen. His descendants still live in Australia.